A. Alterations: At some point in it’s history, both the South and East porches had been enclosed, using aluminum windows and doors. In the South porch, the original porch flooring was in tact, but needed replacing. On the East porch, the flooring had been replaced, but not in the manner of porch flooring material. There have been no other known alterations to the house. B. Historical Figures who are associated with the property: In addition to it’s historic style, the Tucker House is eligible due to its association with the Bass family, who helped to establish McKinney as one of Texas’s major centers for cotton fiber manufacture. They conducted business at the ‘Modern Farmers’ Gin Plant’ in the southeastern part of McKinney. This was one of the most modern cotton gin plants in North Texas. 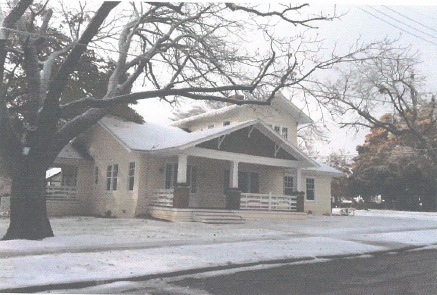 The home at 1215 Tucker St. was originally built to suit Richard Dayton Bass and Vivian Hill Bass, married in 1913. Richard engaged in business with his father, J.D. Bass, in the firm of J . 0 . Bass &Son. After their marriage, Richard and Vivian built Tucker House (at 1215 Tucker Street), and raised three children there. Their children’s children continue to visit Tucker House periodically, and they continue to be supportive of efforts to restore the property. C. Property Ownership: A location map is attached. See Drawing No. 1. Legal Description of the Property: Lot lA, Block 13, Waddill The Bass family occupied the house from it’s construction in 1915 until approximately 1960, and ownership transferred to Leo Crockett, the local automobile mechanic. The Crocketts owned the house until its sale to us, the Matthews Family, in 2012. D. Tenant History: Initial owners: Richard Dayton Bass and Vivian Hill Bass, along with their three children, William D. Bass, Richard Carr Bass and Vivian ‘Poppy’ Hill Bass. The second owners: Mr. Leo Neill & Mrs. Louise Cain Crockett, and two daughters, one named Linda Crockett. E. Narrative History: Both Richard and Vivian grew up on Tucker Street, in McKinney. Richard’s father’s home at 804 Tucker Street is currently on the National and City Historic Registers, and is a living tribute to the City of McKinney. Vivian’s father’s home was originally located a t the corner of Tucker and College Streets. That house has been demolished, and a new home stands on that property. Richard married the ‘girl next door’ on March 28′” 1913 in McKinney. After their marriage, Richard and Vivian built Tucker House, and raised three children there. Their children’s children continue to visit Tucker House periodically, and they continue to be supportive of efforts to restore the property. It is know that the Bass children continued to make great progress in their town. William D. Bass, the couple’s firstborn, continued in the family business as a third generation cotton merchant. He was a member of The American Cotton Shippers’ Association, the Texas Cotton Association, the Lubbock and Dallas Cotton Exchange; and was a charter member of the McKinney Country Club. He married Fay Powell of Lone Oak in 1938. Their son, Richard Hill Bass, continues to visit me at the Tucker House. Together, Richard and I located markings that showed his growth (made by his grandmother) on trim pieces in one of the downstairs closets. This was a piece of history that we were both thrilled to uncover. Dr. Richard Carr Bass graduated from TCU in 1937, where he competed in the inaugural Cotton Bowl on New Year’s Day that year. After that, he went to Texas A&M and became a doctor of Veterinary Medicine. Later, he was a WWII Intelligence Officer, where his duties included studying the bomb damage at Hiroshima. Vivian Hill Bass (the younger) was one of the first females to graduate from TCU. She married Charles McKissick and lived in McKinney until her death in 1977. When Tucker house was built, the property extended from Tucker Street South to Hill Street and further one lot to the East as well. It is not know at this time when the lot sections were sold or when additions were made to those plots. F. Drawings: Attached are drawings depicting the Tucker House’s lot and buildings. Two Sanborn maps are attached. The first, dated 1914 shows the undeveloped property at Tucker and Waddill; and the second, dated 1920 shows the Tucker House property where it stands today, in the lot reaching to Hill Street. 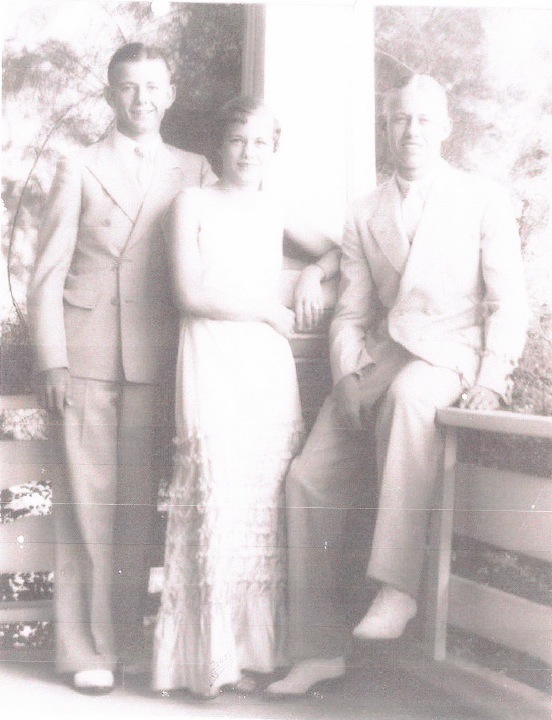 G. Photographs: Attached is one historic photograph, taken of the three Bass children, arranged on the front porch c. 1930. This photo shows the original porch columns and rails. Also attached are photographs showing each directional facade of the house, as well as street views.